The Creative Show Presents Gogglebox 2017 in the Lime Tree Theatre. The Creative Show is the brainchild of Angie Smalis, Artistic Director of Limerick Youth Theatre and Donal Sherlock, Manager of Daughters of Charity Service, Limerick. Its purpose is to integrate members of the youth theatre and service users by creating a variety show. Pictured is director Myles Breen and performers at rehearsal. This is the seventh year and it has been so successful and grown so big that the name The Creative Show is used to encompass all the different participating groups as performing the piece are Limerick Youth Theatre, service users from the Daughters of Charity Service Limerick, transition year students from the Laurel Hill Coláiste FCJ and Ardscoil Rís choirs, dancers from Patterns Dance Collective and Limerick Youth Dance, the Lumen Street Theatre Company along with musicians from Music Generation Limerick City. 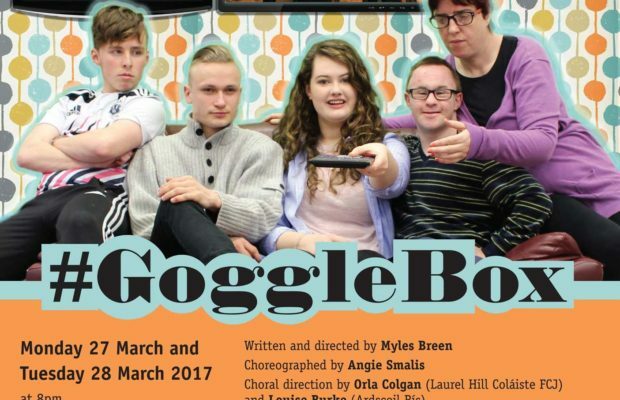 This year The Creative Show presents ‘#GoggleBox’, a comic family show written and directed by Myles Breen with movement pieces devised and choreographed by Angie Smalis, based on the hot TV show ‘Googlebox’. LYT members, service users, choir, dancers and musicians rehearse together over the course of three months culminating in over 170 young adults and service users participating in this project with two evening performances at the Lime Tree Theatre. The Creative Show presents GoggleBox on Monday, March 27 and Tuesday, March 28 at the Lime Tree Theatre at 8pm. Tickets available at www.limetreetheatre.ie/show/creative-show-2017.